Should Your Band Fake It Till You Make It? Why Your Band's Social Media Game Is All Wrong. We’ve seen so many different “marketing” trends come and go in the band community. So what are the big promotional marketing trends bands are doing today that just aren’t doing them any justice? So many questions may spring up from this topic. What statistics are record labels looking at in 2019 that bands SHOULD be focusing on? What type of content works and where does that content best perform? Is it time to abandon Facebook and just focus on Instagram? Does your band need a Social Media Manager, or can you handle it on your own? Does any of this really have an affect on me? Let’s dive in, because I think someone needs to give some guidance from an objective marketing perspective for those of you following the leader. The foremost ill-advised facet of social media I see bands and individual musicians doing is bot-commenting. At some point along the line Social Media became a gigantic task for people to put effort into for promoting their endeavors. So where have people turned to? Bot-commenting. What is that you might ask? Have you ever gotten a consistent 4-5 comments and “likes” in a row from a musical instrument brand or band account? Something to the affect of an emoji, and that’s it? Welp, that account paid for a bot to lazily comment on your posts based on hashtags you’ve used. This all begins to teeter on the brink of sociopath media, versus social media. Imagine you’re a person in a group of 20 people. Each person is showcasing a talent or piece of their life with the group. If you were the bot-comment social account type, you’d be telling everyone person “thumbs up”, regardless of whether or not you were paying attention. At some point, you’re giving a “thumbs up” to someone who divulged information that isn’t pertinent to a “thumbs up”. That’s when the smoke clears, and all you have left is a mirror. What’s the harm in this? Well, at this point, people are so social media obsessed that they actually check their follower counts to see who stopped following. You can assume the people who will jump off the support ship over something as trivial as unfollowing them are the type of people who will notice right away. So if you’re on a following spree, only to start unfollowing people after your numbers climb up, take into consideration that some of the people may take it personally. As silly as it may be, this is very much a reality for people who are measuring their importance based on social media statistics. Not to mention that your endeavor accounts should NEVER have an imbalanced follower to following ratio. Meaning, if your band has 1,000 followers, you shouldn’t have 500-2000 followers. The only accounts you should be following are accounts you will interact with, or, accounts that have an involvement in your business. Any time I see a band with 3,000 followers and they’re following 4,500, I automatically assume that their numbers would drop drastically the instant they unfollow 50% of the accounts they follow. 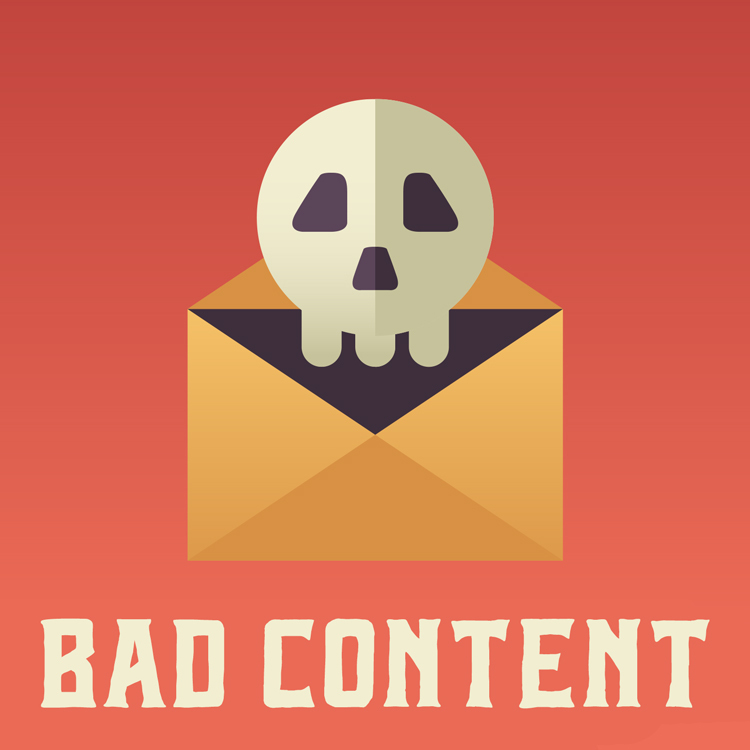 What makes for bad content? Social Media is an amazing marketing tool for bands who are doing their content posting appropriately. It’s also a cemetery for bands that can’t keep up on their social game. One of the sure-shot points of evidence against lazy social promotion are memes. If you’re posting more memes than you are photos and videos of your band, you should just stop posting PERIOD. Your concept for marketing should surround contributing to a community by adding unique content. Using a meme as a tool with the hope that the meme will catch on and you’ll be a part of a reshare campaign is absolutely misguided. It’s not that hard to take a video of your drummer doing blast beats while everyone is trying to talk, so share that. Do literally anything other than practically nothing, which is just sharing memes and nonsense that is irrelevant to the music your band is slinging. At the end of the day, sure, 200+ people will like a picture of your pet store designer dog - but what good does that do for marketing your music? ? Facebook, or Instagram? Spotify or YouTube? What are Record Labels focusing on? Record labels are focusing less and less on social media than ever before. I know this first hand from speaking with several label folks, discussing what the labels are looking for in bands these days. Granted, some labels are still measuring a band based on this, but most of the label A&R scouts are well aware of faker tools. They generally want to avoid bands with inflated statistics mostly because of the investment they’ll be making into a band that isn’t actually as big as they purport via social numbers. It’s been seen time and time again, bands who have 40,000 likes on Facebook who play shows to 20 people. The numbers just never add up! Where are they looking? Spotify. Want to talk about a place that’s incredibly hard to fake it till you make it? If your band is dumb enough to pay for plays and monthly listeners and followers on Spotify in 2019, you’re inches away from having your music taken down from Spotify permanently. Yes, record labels are paying attention to these numbers, but it’s unwise to pay for bots to hyper-inflate these numbers. Why? Because Spotify has to pay a royalty to you, and they aren’t doing that if they can sniff out inauthentic plays. And trust me when I tell you that they have the technology to figure this out, and it’s been implemented. It may not kick right away, but after their analytics team gets a hold of royalties and their sources, they will begin flagging farcical plays which will come back to haunt you indefinitely. Absolutely NOT. Instagram has incredibly large limitations for music content. We may be in a time where everyone under 30 is visually obsessed with content, BUT, in terms of repeat consumers of your jams, those folks are 25+. And a lot of those people are sticking to both social media platforms, especially those over 35. What does that mean for you? It means that your long-term fans are sticking to the sources they rode in on. To neglect one over the other is absolutely preposterous in terms of marketing. You wont find a marketing agency in the entire world that thinks abandoning one social media platform for another is a good idea. Sure, you can favor one over the other when it comes to quantity of posted content, but you can’t just entirely stop using one over the other. Does my band need a Social Media Manager? Lastly, does your band need a Social Media Manager? If you have it in your budget to hire a legitimate Social Media Manager, it isn’t a bad idea to push forward with that. Unless you have someone in your band who is consistently posting material on a daily basis, you’re missing a huge market to keep your audiences engaged. A Social Media Manager has a few edges to their sword that a lot of people don’t have the time to develop. Most good social managers will be statistic driven, constantly checking in on the insights and analytics of how posts are performing, in an effort to optimize future content. Good social managers will also post at appropriate times to the day of week, and know what type of content does well at that time. How many people wake up at 7am and want to hear clipped-audio band rehearsal footage while they’re on the toilet? Not many, if any at all. No, that content may perform better mid-day, or even at night while people are assumed to be laying low at home after a long day of work. One thing I can strongly advise is that you don’t hand your account over to someone who claims to be an expert at Social Media, yet they have a very low success rate on an individual or professional level. Do some research. In conclusion, this is more of a plea for ending the social media sociopathic nonsense that is plaguing the music industry. Focus on your music, focus on showcasing your talent and creativity, create content that people will enjoy and talk about and share. If you’re not here to promote your music, and you’re just obsessed with feeling statistically desirable, maybe you should try marketing instead of the arts. It’s okay to combine the two, but you need to be conscious of the inner artist that’s inside of you. It’s very revealing to see bands and musicians not only pushing soulless music, but also entirely missing the concept of marketing. The people in the industry who you want to discover you are infinitely more hip to the farcical tactics that people are lackadaisically integrating into their strategy.